In Mastin Kipp’s recent TDL post, he talks about how we are not a reflection of the world but rather how the world is a reflection of us. So, does that mean that if we wake up one morning feeling happy then the whole world will respond to us with kindness? Will strangers wave hello? Will customer service reps really mean it when they say, “How are you?” Probably not. Everyone has the core fears that they aren’t enough and if they aren’t enough, they won’t be loved. Everyone. And MANY people spend more time looking for evidence about why they aren’t enough than why they are…You may have been a victim of a past event that you still identify with as a victim, but can you really be a victim of something that happened in the past unless you allow it in the present? So how did I snap out of my unworthy funk last night? I didn’t. The truth is: I had to ride that tidal wave until it was over. It happened sometime around 11 a.m. this morning. And it wasn’t fun. As I sat in a meeting this morning with my mind racing about how much I didn’t deserve happiness, I had to consciously wrestle fear and guilt back down to the little cave they live in deep inside of me. (Someday I’ll figure out how to evict them altogether.) I had to remind myself–and really convince myself–that not only am I good enough but that it’s okay to want MORE in my life. More love, more peace, more happiness. 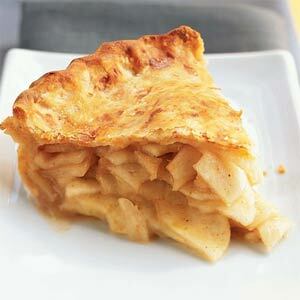 I’m starting to think of happiness as an apple pie. I may not be ready to take the whole pie (because that would be selfish, right?) but I’m going to take a really, really big slice this time. Edward: I think you are a very bright, very special woman. Vivian: The bad stuff is easier to believe. You ever notice that ? I am right there with you with these thoughts. Luckily we are not alone. Maybe we can help each other serve eviction papers to those a-holes fear and guilt. 😉 Just remember that happiness is yours for the taking. Throw yourself into it. Wallow in it. Go nuts. Wanting the whole pie is not selfish. It’s human. Some times we neglect our own self, by putting other people’s needs and happiness ahead of our own, which then leaves us empty and unfullfilled. Fear and guilt are two conduits of this practice and play right into our insecurities. We need to remember to love ourselves first and push all our inner “voices” aside in order to live up to our full potential. When that happens, we attract others like a magnet to our true, loving selves.